Protecting cyberspace from attacks both foreign and domestic by 2028 requires a national “moonshot” commitment to rally support and educate our young people to create the necessary workforce to bolster our security, insisted speakers at the symposium, “Attacking the Roots of Cyber (In) Security: The Role of Education.” The Cyber Center for Education & Innovation (CCEI)–Home of the National Cryptologic Museum (NCM) conference was hosted by University of Maryland University College (UMUC) Nov. 8. They used as their model John Kennedy’s call to action—to land a man on the moon before the end of the 1960s—that inspired the nation. But skeptics at the conference questioned whether the cause of cybersecurity could possibly inspire the same enthusiasm as the potential for a moon landing. Retired Navy Adm. Betsy Hight, now vice president of Cybersecurity Practice at Hewlett-Packard, said the term “cybersecurity” itself creates a language barrier in describing the need for protection in the digital age. Via conceded that Hight was right. Perhaps the answer is to start with talking up STEM education—with its focus on Science, Technology, Engineering and Mathematics disciplines—that already has become the buzz term of education, he said. 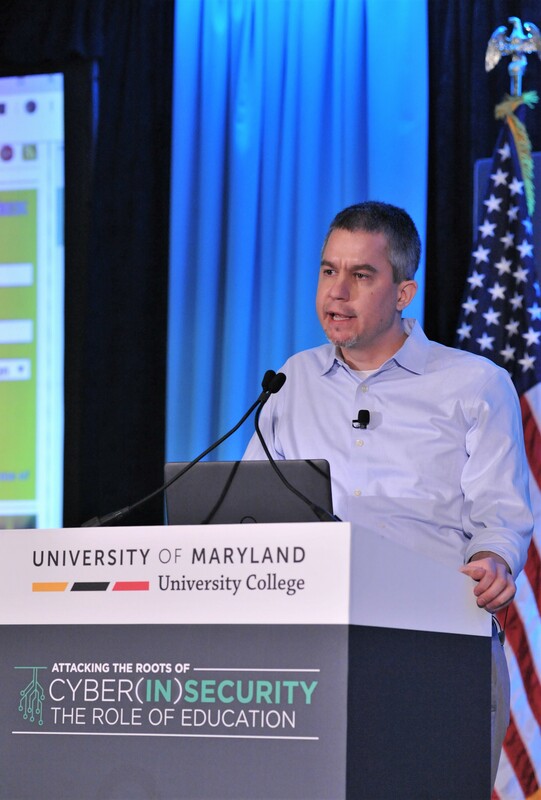 UMUC is proud that since 2010 its cyber programs have added more than 11,500 graduates to the workforce, while another 17,300 students are currently enrolled in those programs, he said. “Equally important, the governor, the General Assembly, and the Maryland State Department of Education are all taking tangible steps to embed computer science and security concepts in curricula, starting in the early elementary grades,” he said. In his remarks, Brit Kirwin, the University System of Maryland chancellor emeritus, noted a violation of a fundamental principle of economics—that a shortfall in the number of cyber experts coupled with an industry willing to pay top dollar for talent, should have produced a greater flow of talent to fill the gap. Yet the gap just keeps getting bigger. Candy Alexander, president of the International Board of the Information Systems Security Association, said the industry is constantly impatient with the graduates coming into the workforce, saying they are not hitting the ground running. Business has to be reminded, she said, that it has a responsibility to continually invest in employee education because technology is changing so quickly. George Washington University professor Diane Burley echoed Adm. Hight’s concerns that students even at the college level don’t know what cybersecurity is. It should be presented to them in ways that the students ask to be employed in it. And still, she said, only 300 colleges and universities, out of 4,500 nationwide have been designated by the National Security Administration to have the curricula and guidelines to teach cybersecurity. And if all of the college students needed for cybersecurity jobs were to suddenly seek to learn it, finding enough professors to teach them would be difficult, Burley said, adding that industry needs to provide employees to teach students, and that would help students make the connection between what they are learning and what they will be doing. But Mary Ann Davidson, the chief security officer for Oracle, said perhaps the approach to cybersecurity is backward. She gave the analogy of the story of the Dutch boy and the dike. He saw a leak and put his finger in it and saved the town. Cindy Widick, the National Security Agency ’s chief of Cybersecurity Operations, talked about the “talent war” for personnel who can protect the internet from a growing threat from international adversaries as well as criminals. The moonshot analysis is a good one, she said. Still, the gap between visualizing a moon shot and understanding the abstraction of cybersecurity is a challenge that must be overcome, said M.J. Bishop, the Inaugural Director of the University of Maryland’s Center for Academic Innovation. The profession doesn’t even have a name, she said. Cybersecurityist?